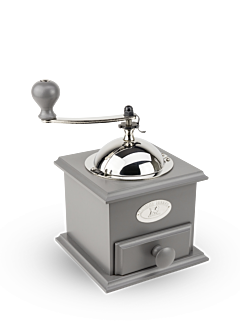 A manual coffee grinder allows the power of the coffee, as well as the ephemeral character of certain aromas, to be expressed. It is an exceptional process that reveals all the richness and depth of its aromatic varieties. Manual Coffee Mill 19 cm - 7,5"
Two-in-one coffee mill and cafetiere 15 cm - 6in. Manual coffee mill in walnut-stained beechwood 21 cm - 8in. Manual coffee mill in beechwood ivory 21 cm - 8in. Manual coffee mill in hand-aged beechwood 21 cm - 8in. When coffee arrived on the European continent, its popularity quickly uncovered a need for a specific item designed to grind fragrant roasted brown beans and preserve its complex aromatic palette with its nuanced flavours. Neither the spice mill then in existence, nor the use of a mortar and pestle, expressed the duality of its character, power and subtlety. 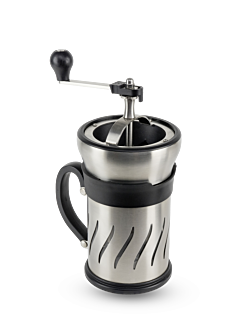 The first coffee grinder with a crank appeared in Turkey in the 17th century. Two centuries later Peugeot, with its expertise in working with durable and quality materials such as steel and wood, and a desire to create everyday objects that are practical and easy to use, without sacrificing on the aesthetics or quality, seized upon this must-have item for coffee lovers. Peugeot thus manufactured the cube-shaped manual coffee grinder upon which its reputation would be built, and coffee mill. A real sensory experience, yet solid, stable and easy to use, it was designed to enhance coffee beans. Producing a grind of rare quality, the old-style manual coffee grinder, made of wood, available in chocolate brown shades, antiqued finish or vintage yet modern colours, combines aesthetics with ingenuity to bring out the myriad pleasures of freshly ground coffee, rich in aromas and in its sensations.